Looking for a romantic way to enjoy Valentines Day? 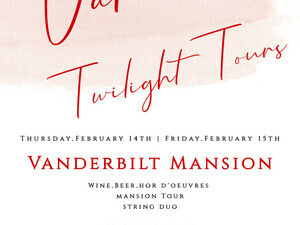 Spend an evening with your Valentine at Eagles Nest, the Spanish Revival mansion of Rosamond and William Vanderbilt on a hilltop above Northport Bay. Your evening begins with music, passed hors doeuvres, wine and beer in the Memorial Wing, amid Mr. Vanderbilts exotic collections. Embark on a guided tour of the Mansion through the familys private living quarters decorated for Valentines Day. See rooms celebrating the romances of Rosamond and William Vanderbilt, Romeo and Juliet, Napoleon and Josephine, and the Duke and Duchess of Windsor. Hear about the legend of St. Valentine. Enjoy the magic of the Mansion. Tours begin at regular intervals from 4:30 to 8:00 p.m. Reserve your tour time now. Like the post-Christmas Twilight Tours of the Vanderbilt Mansion in its holiday finery, these tours may sell out fast. Early reservations are encouraged. Tickets are $45 per person, and $35 for Museum members. 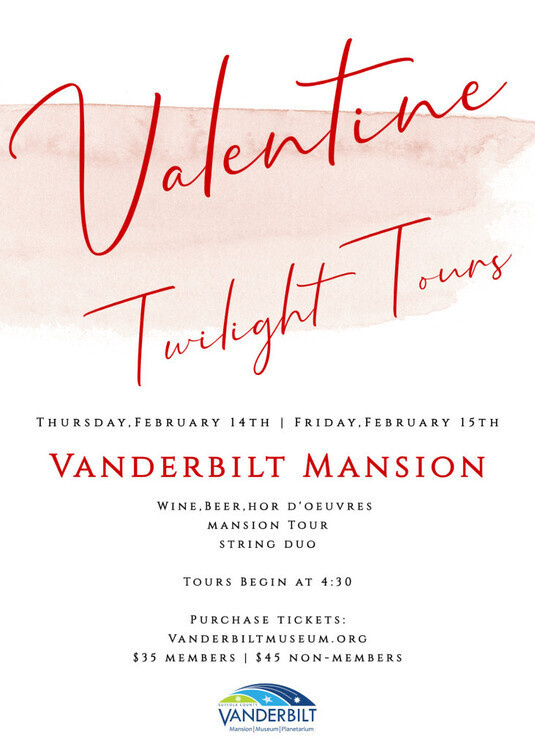 Valentine twilight tours and decorated the great thoughts and sharing for memorial guided encouraged tips. Great job, thanks to https://www.australian-writings.org/ site exotic decorated collections included, keep it up. If you are here to know where is my computer in windows 10 so you may have help and support of this platform http://mycomputerwindows10.com which includes all beneficial information and will also make all your work easier. Try out for once.